The big news this month is the release of our fall schedule, with many exciting new products. See at right. The big release in June was Captain's Log #39. We released the Captain's Log #39 Supplementary File just a few days ago. Federation Commander makes Mizia's Tactic a lot harder to prosecute than it is in Star Fleet Battles because there are only eight firing opportunities in each turn, but it does give you one additional chance to exercise it, namely shield burn through (3C8). If, for whatever reason, you do not expect to be able to get in close for an alpha strike, then dividing your fire into two or three bursts at Range 3 to Range 4 can get you a "mini-Mizia" effect. Two disruptors and two phasers (they have to be phaser-1s at Range 4) give you a very good chance of getting ten points of damage, and a single photon backed up by a phaser-1 gives you a 25% chance. Having done your ten points of damage you get nine shield hits and one internal. If you opt for "targeting weapons" then you will have a 50% chance of getting a phaser, allowing you to wear away at your opponent's weaponry. If you have drones, then they count as a separate volley to your direct-fire weapons, hence giving you an extra point of burn through. However if you can arrange to hit with two or three of them at the same time then that is probably a downed shield which is even more useful, and might allow you to get to one of the all important "torpedo" results on the Damage Allocation Chart. Suicide freighters can be powerful weapons, but are limited by the ease with which they are disabled. All that is usually necessary is to disable the freighter's engines - an easy task - and it will be dead in space, even if most of its "cargo" (warhead) is still intact. However, when attacking a base in orbit, the planet's shadow can be used to protect the suicide freighter from the base's weapons. You will need a large freighter, or a small freighter equipped with one of the various bolt-on modifications that adds a tractor beam. Warning: There are a lot of "ifs" and this won't work in every situation. Assume a planet in hex 2215 and a base in counterclockwise orbit, currently in hex 2214. Approach the base from the opposite side of the planet, so it shields you from the base's fire. Bring another ship with you, within tractor range. Time your approach so you will be in the appropriate hex (2216, in this case) on Impulse #30. The consort ship will need to be moving at a speed fast enough that, if the freighter is tractored, its pseudo-speed will still be at least seventeen (so it will still move on Impulse #31). You can get by with a lower pseudo-speed if you are willing to give the base more than one Impulse to fire on the freighter, in which case you would also need to move the entire schedule ahead one Impulse. On Impulse #30, have the freighter tractor the consort ship. Of course, you could tractor it sooner, perhaps to keep the two ships together. Rule (302.51) allows fighters fed forward from different carriers to be combined to make full ship equivalents of six fighter factors. As luck would have it, two D6V groups combined with two FV groups gives you 18 fighter factors, for your limit of three ship equivalents. The same can be done with one SPB group and two WarHawk groups. This is a good way to get your fighters on the line from these unusual carriers. It is also a reasonable justification for building D6V and WH carriers. Every month we will feature one of our miniatures that has been painted by a fan. If you paint miniatures, submit pictures of your minis and they may be selected for the next Mini of the Month! Communique #44 has been posted to the Commander's Circle. Klingon Armada: SKU 6101, Price TBA. Starline 2400 Seeking Weapons: Data to be available soon. 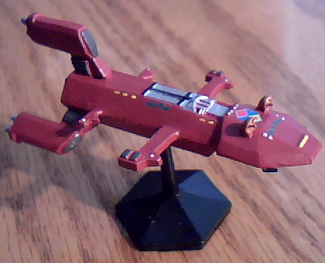 Starline 2400 Fighters & Shuttlecraft: Data to be available soon. "Be at ease, Lieutenant," Commander Kerwik said as the Marine entered the bridge. "I appreciate the respect, but having shown it, more is not necessary. "You are not familiar with this type of vessel, are you?" "Only in the most general sense," Rakarra said. "I know that a handful of these ships bring the highest priority cargo and passengers to fleet flagships. I would hazard a guess that this type of mission is as new for you as your ship is for me." "You would be wrong, Lieutenant," Kerwik said. When Rakarra stiffened, Kerwik smiled and waved his hands. "No rebuke was intended, Lieutenant. As it happens, this is the second time since I have been captain of this ship that it has be co-opted to run down a mutineer. It's always a sad duty, and while one I perform, it is not one I boast about." "This is my first mutiny," Rakarra said. "May the stars grant it be my last. What do I need to know about your ship?" "We're faster than Demonslayer," Kerwik said, "faster than anything, really. This ship is half engines and half fuel, and the space for cargo, crew, and passengers is an afterthought. We could overtake the Demonslayer in about twenty-six hours, even with her head start, except for the fuel situation. Each of the two refueling stops will cost us at least two hours, most of that in docking, running the fuel lines, and undocking." "Tell me of this, if you will," Rakarra said. "In simple terms," Kerwik said, "we cover in three hours what Demonslayer covers in four. We are only nine hours behind them, but it will take twenty-seven to catch them. Plus time to refuel, hours that will delay us even more." "Why do you not have fuel?" Rakarra asked. "I ask only so I can learn, and mean no disrespect." "Our mission profiles are routine, but unique," Kerwik explained. "We set out from Klinshai with full tanks and run at top speed until we meet the Northern Flagship. That leaves us enough fuel to travel at cruising speed back to the Northern Starbase. There we pick up nearly a full tank of fuel and run at top speed back to Klinshai." "I understand now," Rakarra said. "Your tanks are nearly empty already and that is why you need fuel, but why did you not get whatever you need from Raidmaker?" "It is a matter of fuel purity," Kerwik explained. "Impurities damage our special high-speed engines, causing major maintenance issues. Our engines are under considerable strain. Every second or third time we return to Klinshai, the engines are removed for a complete refurbishment, and replaced with a refurbished set removed earlier. Keeping the impurities to a minimum is important." Tos Crawford asks: Question on (P9.3) "When a gravity wave enters a hex occupied by a unit (or vice versa), the following effects are applied to the unit . . ." On Impulse #16, my ship gets hit by a gravity wave and takes damage. On Impulse #17, the gravity wave moves to a new hex. My ship moves into the hex the gravity wave is now in. Does the ship get hit once or twice? It does not seem physically possible to get hit with the same gravity wave more than once, but a strict reading of (P9.3) makes it sound rather unhealthy to "ride the wave". ANSWER: The wording of (P9.3) (". . . or vice versa . . .") makes it clear that the unit would continue to take damage. The gravitic force would extend throughout the hex. There are no provisions in SFB to "ride the wave". Robert Eddy asks: Rule (P9.33) states ". . . and no type of terrain creates a "shadow" in the wave." Rule (G10.751) states ". . .If a gravity wave passes over a web, there will be a corresponding reduced strength segment from that point forward." Rule (G10.751) as it is stated can create a hole in the gravity wave, which would seem to contradict rule (P9.33). How is this resolved? ANSWER: A web is not really terrain, and rule (P9.333) specifically overrides the provisions of (P9.33) for webs. It is a case of a specific rule (P9.333) overriding a general rule (P9.33). Herb Diehr asks: When firing down the hex line at the edge of the atmosphere of a planet, is there a +1 ECM or not? ANSWER: Firing down a hex-line edge of an atmosphere does not block the fire and does not enter an atmosphere hex [(P2.321) and (P5.511)], so there would be no ECM bonus. Question: Does a force at a friendly base or planet have a requirement to accept an approach battle if an enemy uses fighting retreat to enter the hex? Answer: No, they do not have the accept the approach battle (no one ever does) and the fighting retreat forces will then just keep retreating. In effect, the forces at the planet decided not to block the retreat. Question: Rule (323.51) states: "If neither player retreats [either as retreat action (323.32) or normally under (302.7)], continue using the ESSC system for additional rounds if necessary. If one player retreats and the other player elects to pursue, then follow the procedures for pursuit (307.0) normally but use these ESSC procedures for resolving any pursuit combat." Now it makes perfect sense that in the Pursuit Round, a casualty could not be resolved by using retreat again because one side is already fleeing and other side gave up the option to give chase. But, this is nowhere stated or explained in the new rule. So is it the case that a casualty can not be resolved as a retreat if it is a pursuit round? The new drone and plasma torpedo miniatures will be released in September.